What Is Chi And What Role Does It Have In Feng Shui? “Chi” is defined simply as “vital life force in and around the body”. Many cultures have their own version of what we know as chi … Ki (Japanese), mana (Hawaiian), prana (Indian) and our western idea of life force. It is dynamic and ever changing, which is the good news … that tells us that no matter what your feng shui situation, it can be changed for a more positive effect. Feng shui is a good way to keep the energy flowing in a balanced way in and around your surroundings. Let’s delve into this a little bit. Have you ever been in someone’s home and you just weren’t comfortable? The chi in their home was most likely stagnating or full of negativity. Do you like one room in your own home better than another? Your Chi is most likely abundant in that room. That feeling is the one we want to capture in each of your rooms so balance, harmony and abundance are alive and well. 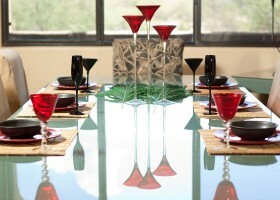 Arranging our homes in specific ways to enhance the chi and make it happy and want to stay around is the goal. In the world of chi everything is alive and connected, from the bed you sleep in to the dishes you use to put your food on that nourishes your body and everything in between. Keeping this in mind, is your home full things that remind of positive or negative things? Do you have stuff that you haven’t touched or looked at in years? Do you have things that have no function for you now but did at one time? It may be time to do a little spring cleaning, and no, it doesn’t need to be spring to start. Any time is a good time to begin your quest into feng shui. These are just some of the things that affect your chi and the feng shui of your home. Looking at how our furniture and possessions are placed, living with what we love and making sure our surroundings are safe and comfortable, this how to bring a better chi into your life. This encourages creativity, self-expression and clarity. We know we’ve gotten to the ideal “Chi” in our homes when we are experiencing happy, healthy, and prosperous lives.